Abraham Blackman was born in Plock, Poland. Blackman came to Victoria by way of Stockton, California with his wife and children. He was a stove dealer, engaged in ironmongery and the hardware business. His first business was Blackman & Marks at 13 Yates Street. He had a business relationship with his brother, Morris Blackman, who was situated in New Westminster. Abraham Blackman served as Vice-President and gabai (warden) of the first synagogue in Stockton, California. Blackman was instrumental in organizing Victoria’s Jewish community. In 1859, along with A. J. Brunn, Blackmancalled a meeting “for the purpose of procuring a . . . Burying Ground.” This resulted in the first Jewish cemetery in Western Canada. He was founding President of the Victoria Hebrew Benevolent Society, in 1859, the first Jewish organization in Western Canada. Blackman also served as first Treasurer of Congregation Emanu-El. He served on the building committee and chanted the Kol Nidre in the first High Holy Days services. 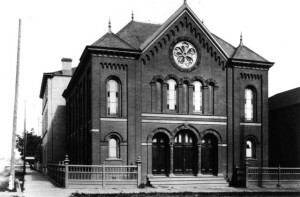 Blackman participated in the laying of the cornerstone of the synagogue, and recruited Dr. Morris R. Cohen, a Sacramento Rabbi, to be the first (Orthodox) Rabbi of the congregation. Blackman was delegated to procure the Colonial Charter or Incorporation Act to establish Congregation Emanu-El as a legal entity. Abraham Blackman was a founder of the Masonic Lodge in the colony, and arranged for the first public ceremony of the Masons – the laying of the cornerstone of the synagogue. In the late 1870’s, Blackman moved to San Francisco where he became President of the Ancient Order of Kesher Shel Barzel (Ring of Iron), composed of Polish-born Jews. Abraham Blackman died in 1888. Cyril Leonoff, editor, “Pioneer Jews of British Columbia,” Western States Jewish History, 37/3&4. Sarah H. Tobe, “Lured North of the 49th, Jewish Colonial Roots,” Western States Jewish History, 46/2&3. Sarah H. Tobe is curator of this Abraham Blackman exhibit.